An annual rock n’ roll festival in the North East returns with a big growing in stature. From Friday 3rd until Sunday 5th August, at Burdon Plain which is situated between Stanley and Sunniside. The festival has plenty of rock n’ roll, rockabilly, jumping rhythm and blues, western swing, hillbilly bop and most points in between, so it’s must for the rock n’rollers of the North East. Camping out and joining the fun means you’ll find some amazing food and drink, then it’s over to the stage to hear some awesome bands and DJs rocking away. With an ample dance floor to bop on, music from The Polecats, The Sureshots, Scottish Frantic Friday, Tex Speed Combo, Jack & The Real Deals, Sister Suzie, Rusty And The Riots, Tennessee Hotshots, The Skip Rats, Emma & The Ragmen, Bernie & The Bluenotes, Beefy La Slap, Saint Dom and The Sinful will get you throwing your best shapes. DJs lined up too are Tojo, Lord Fat Kat, Bad Boy, Stu Cambell, Rob’s Rockin Jukebox and Poorboy Paul. There are record vendors, clothing stalls and lots of vintage and retro goodies to be had, alongside tattooists and photographers for really lasting memories of a toe-tapping, foot-stomping good time. 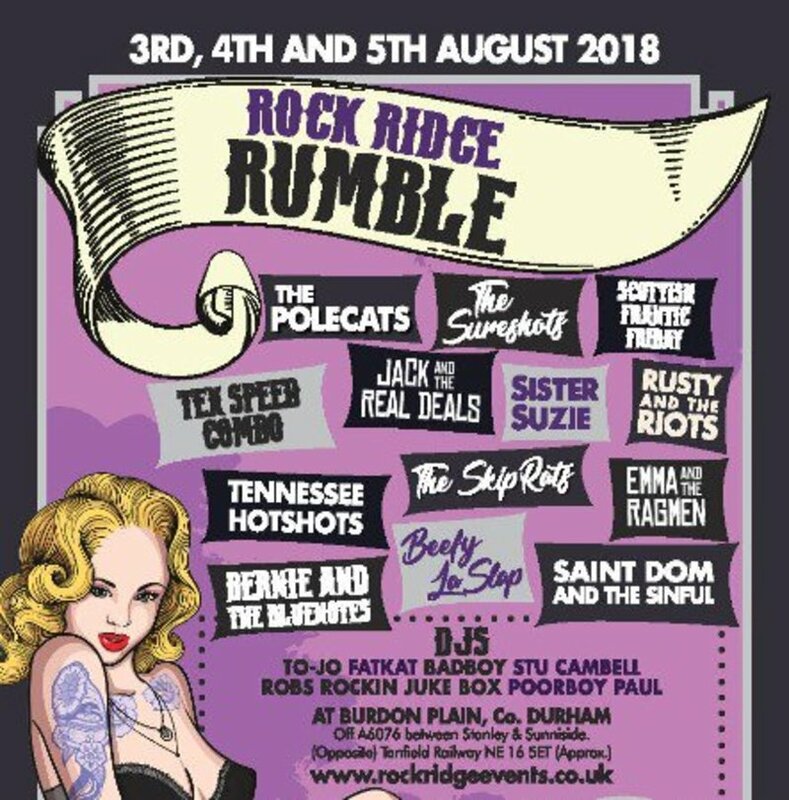 Rock Ridge Rumble is at Burdon Plain, County Durham from Friday 3rd until Sunday 5th August.